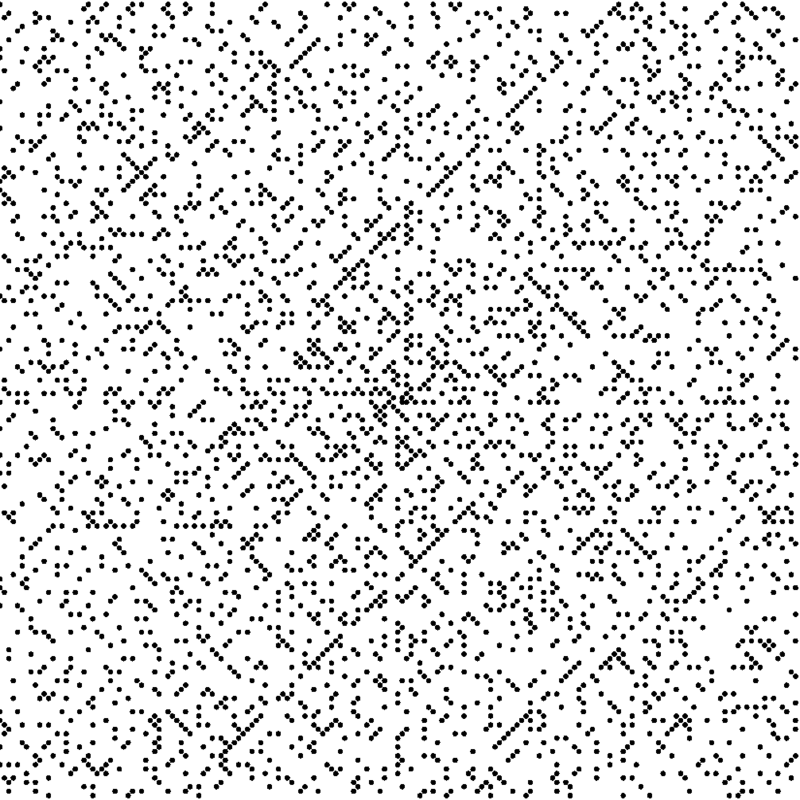 In the above variation of the Ulam spiral, red squares represent prime numbers and white squares represent non-primes. Image source. I can’t decide if I care about prime numbers. On the one hand, the idea of indivisibility is interesting as it relates to consciousness. In some sense, I think that the universe, and each experience of it, is a one-hit-wonder. All appearances of repetition are local to some frame of reference. If someone is color blind, they may see alternating red and green dots as a repeating grey dot. If you listen to someone speaking a language that you can’t understand, it can seem, on some level, that they are saying the same kinds of sounds over and over again. I wondered if any random constraint would appear to contain pattern when mapped as a spiral like that. This one above is yellow hex if the number spelled out contains the letter i. Writing these out I noticed how the language we use to name the numbers is isomorphic above ten. A trivial observation, I know, but I think that this logical version of onomatopoeia reveals some insights about recursive enumeration, and its foundation in an expectation of the absolutely generic. To someone who is fascinated by prime numbers (often in a hypnotic, compulsive kind of way, as these spirals suggest), part of the appeal may be that the patterns that they seem to make defy this expectation of generic, interchangeability as the basis of counting. Three isn’t really supposed to be different from two or one, it’s just “the next one after two”. Finding these cosmic Easter eggs by poring over mathematics is, as the movie Pi dramatized, a weird kind of quasi-religious calling. Seeking to sleuth out a hidden intelligence where neither intelligence nor secrecy would seem possible. Numbers are supposed to be universal; publicly accessible. There shouldn’t be any proprietary codes lurking in there. Maybe there aren’t? Without mapping primes into these spirals to look at with our eyes, the interesting sequences and ratios in mathematics would not be so interesting. Mathematics may provide the most neutral and bland medium possible for the projection of patterns. Like a supernatural oracle or Rorschach inkblot, an ideal medium for pareidolia and conjuring of simulacra from the subconscious. Math is haunted alright, but by pattern recognition – sense making, rather than Platonic essences. Because math is an ideal conductor and insulator for sense, it does end up reflecting sense in a clear and concise way, however I think it is mainly a reflection. Math is not the heart of the universe, not the whole, but the hole in the whole – a divider which shaves off differences with the power of indifference.